Join us for a day of drawing and exploring the natural wonders of London Wetlands Centre at Barnes this summer. Let’s be honest, we’re mostly going to see Todd and Honey, the insanely cute Asian Short-Clawed Otter couple who charm all visitors with their funny feeding habits, acrobatics and agility in the water. We’ll have a chance to meet and learn about these wonderful animals through spending time sketching them in their waterfall enclosure, and through talks from expert wetlands staff. As well as the otters, there will be plenty of tame and friendly waterfowl to sketch around the reserve including grebes, cranes, geese, colourful and charismatic ducks and cheeky herons that hang around trying to steal the otter’s food! Summer visitors that we might spot might include lapwings, plovers, sand martins and – if we're lucky – water voles! We’ll learn about these carefully balanced ecosystems and how vital these protected natural habitats are for wildlife, both local and migratory. We will meet at 10.45am at the centre (just 30 minutes from Central London) with the chance to grab a tea or coffee from the cafe and enjoy the fresh air! All materials will be provided for you on the day, including pens, pastels and watercolours plus drawing boards and seating. You're also very welcome to bring along any particular media you prefer to work with. Together as a group we will make our way around the beautiful wetland landscapes, stopping at specially chosen sections to sketch the otters, the birds and the beautiful landscape. The day will be relaxed and friendly and we'll have plenty of creative advice and step-by-step guides to help you capture moving animals on your page if needed. Though we'll largely remain together as a group, if there’s a particular animal or area of the nature reserve you’d like to draw then we will be able to facilitate that. Experts, volunteers and avid birds watchers at the reserve will be able to answer all your questions and there are also short talks throughout the day that you are welcome to attend. We'll break for 45 minutes for lunch at 1.15pm (an area will be booked at the cafe, or you're welcome to bring a packed lunch) then we'll meet back at 2pm to catch the Otter feeding time! This class is open to all abilities and ages, suitable for complete beginners, and the centre has excellent accessibility with level access around the site. Your ticket includes the entry fee and donation to WWT, though lunch and transport to the wetlands are not included. WWT are the UK's leading wetlands conservation charity and their work includes protecting, restoring and maintaining the vital biodiverse wetlands habitats across the country and saving critically endangered species from extinction. Their beautifully maintained wetlands centres are open 364 days to the public, in order to inspire learning and appreciation for these precious ecosystems and promote that all-important connection to our natural world. You're welcome to use a Wild Life Drawing gift voucher against the price of this ticket, and pay the remainder via Paypal or BACS. 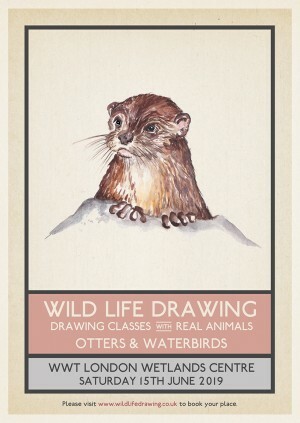 Please email Jennie on info@wildlifedrawing.co.uk to redeem your voucher or to ask any questions.